Mallett’s Creek and its tributary, the County Farm Drain, are significant contributors to the Huron River, and services over eleven square miles of floodplain. Numerous water quality issues plague these streams including destruction of bank vegetation, erosion, sedimentation, and increased water temperatures. Much of the stormwater runoff within the Mallett’s Creek Watershed flows from impervious surfaces in urban/residential areas of Ann Arbor. This collected surface runoff contains high levels of phosphorus and other contaminants and eventually flows into the Huron River without adequate buffers for filtration. 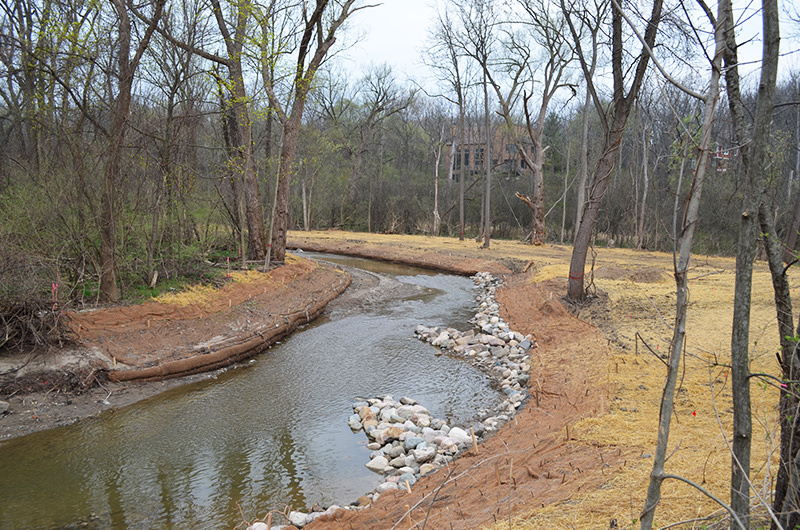 The Washtenaw County Water Resources Commissioner’s Office teamed with the County Parks and Recreation Department and City of Ann Arbor to stabilize 1.5 miles of stream within municipal park properties (County Farm Park and Braun Nature Area). Niswander Environmental was subcontracted by OHM, Inc. to provide the necessary assessments and recommendations for increasing the creek’s stability and ultimately improving water quality in the watershed. Niswander Environmental provided on-site survey, a hydrogeomorphic assessment, restoration & flood attenuation design, MDEQ permitting, construction bidding and oversight, and long-term maintenance plan services. The goal of the project was to reduce erosion, stabilize the channel, minimize the long-term maintenance required, and improve water quality in both Mallett’s Creek and County Farm Drain. Niswander Environmental, in coordination with OHM and the MDEQ, surveyed the stream corridor and conducted a wetland, hydrology, and hydrogeomorphic assessment of the project areas. The survey revealed several areas of in-channel blockages, severe erosion, unstable channels, and large amounts of alluvial sediment buildups. To alleviate these problems, a stream restoration plan was created that included removing the sediment buildup areas, widening the channel to allow for adequate flow capacity, reshaping and stabilizing the streambanks, installing in-stream structures, and creating off-line detention for floodwater treatment that would also serve as a habitat restoration area. Vane arms, cross vanes, and W-weirs were installed at meanders, culvert crossings, and in areas with high velocities to direct and decrease the force of the flow so as to minimize bank erosion. Streambank stabilization practices included installing toe rock protection & coir fiber blocks, erosion control blankets, live stakes, and native seed mixes. In addition, a vegetated buffer was re-established using native shrub and prairie species. Construction commenced in 2011 and Niswander Environmental provided OHM assistance with construction oversight issues, specifically regarding the in-stream structure installation, streambank stabilization, and seeding and planting. Niswander Environmental also created a long-term maintenance plan to ensure the success of the implemented design.